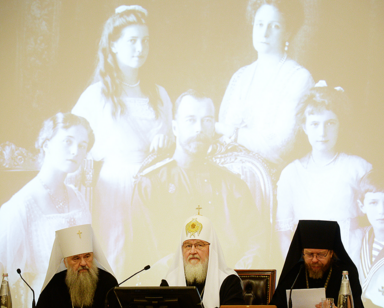 Patriarch Kirill of the Russian Orthodox Church says he's working with Vladimir Putin to convene a Church-based inquiry into whether the execution of the royal family by revolutionaries in 1917 was actually a Jewish ritual killing; this appears to be an actual thing the Russian state is about to do, with many details confirmed in a public statement by Moscow's General Prosecutor. Russian Orthodox Bishop Tikhon Shevkunov expressed disgust at the idea that investigating a hundred-year-old revolution as a secret Jewish ritual murder plot made him an antisemite. Andrei Kuraev (right), a protodeacon of the Church in Moscow, academic theologian, and critic of Kirill’s policymaking, said in a radio interview this week the ritual murder charge is a public relations ploy by the patriarch’s faction. “Twenty years ago when you saw the first investigation, the Synod made its request to the investigating commission — is there any reason to believe the murder was a ritual. The answer was – no. Now, in the new case we are talking about what Patriarch considers his policy – [he is] flirting with right-wing circles inside the Church. Trump’s handpicked Attorney General Bill Barr says the report prepared by Special Counsel Robert Mueller’s office will be ready for public release within about a week.